With his one year volunteer anniversary coming up, Noah has easily become a familiar face to Tuesday Drop-In Nights and has met any challenge we’ve thrown his way. He has the capacity to find humor in anything, and we appreciate that! Noah learns quickly, listens, and is excited to share his knowledge with those he works with, a much needed quality of our Tuesday Night routine. He frequently shares thoughtful insights on bike maintenance at the end of his shifts and rightly deserves his Holiday Bike Drive Mechanic certification. To add to his volunteer resume, we congratulate Noah on becoming one of our new Bike Camp Junior Instructors and can’t wait to hear the fun stories he’ll have after riding through miles of Portland streets and parks with our youth Bike Camp program. Get to know Noah a little more! I began volunteering at the Community Cycling Center at the August 2011 volunteer orientation and started the following Tuesday. I started volunteering here to better my bike mechanic skills, which were virtually nonexistent. It sounded like fun (and it is), and I met my school community service hours very quickly. I also joined with my dad, Charles Edelson, who gave me the push to branch out and volunteer. It is fun on Tuesday Drop-In Nights to ask for help from him if I get stumped. My favorite thing about the Community Cycling Center is the sense of accomplishment of making an unusable bicycle usable again in one night or less. I enjoy working on the bicycles on the Tuesday Drop-In Bights because the bicycles have a strange way of clearing my head and I leave the shop with a smile on my face. The Bike Camps so far have been a blast with great instructors and kids, who make me smile each day. Riding each day also keeps you in shape, because riding with a pack of 5 year olds is harder than out sounds. All that slow riding makes for good practice in being patient, and along with bike repairs, the Community Cycling Center has really helped me become a much more patient person, which I have needed a little help on sometimes. Overall, the Community Cycling Center helps me build my mental and physical health, all with a smile on my face. 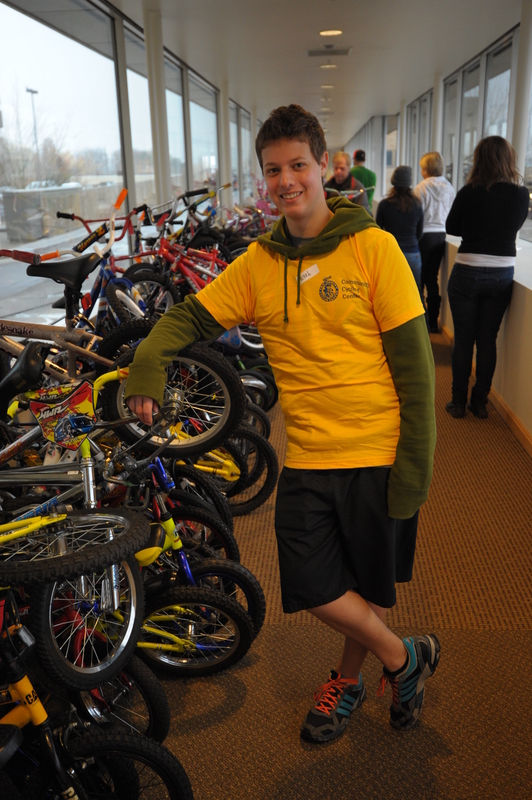 I have been doing Tuesday Drop in Night volunteer work for the Holiday Bike Drive since August of 2011 and I’ve volunteered at the actual Holiday Bike Drive at Emanuel Hospital, guiding kids through the process of getting their bikes. As of July 2nd, I am a Junior Camp Instructor at the summer Bike Camps. On my first day as a Junior Instructor I had the privilege of meeting a very friendly bee, and beat the campers to the first aid kit. All of the programs at the Community Cycling Center are great and do all kinds of good in the community, but my favorite program is the Holiday Bike Drive. I love leaving my daily worries and hardships at the door, only to find them in a seemingly easy Holiday Bike Drive bike fix. Luckily, all of those tensions are released when I hang up a finished bike and I walk out of the door feeling happy. Nowadays it is hard to choose a single favorite bike because there are so many outstanding bikes to choose from. They need to be road bikes that are high performance, but would also look good. A good bike to have for pure speed would be the Cervélo S5 for its aerodynamic ability. For a combination of looks and capability, The BMC IMPEC would be very cool, especially if I put red accessories on the bike to match the red accents. I would also be cool with a bamboo bike. But I do like my current bike, a red Griffin, which has treated me well over the years. When I am not volunteering at the Community Cycling Center, I am either cycling or playing disc golf. I am a road cyclist, and jump on every opportunity to rack up the miles. I love to climb, and take almost every opportunity to charge up the hills. I started playing disc golf the same summer as when I started volunteering at the Community Cycling Center, and I got a couple of my friends hooked as well. During the school year, we got into a routine of going to Pier Park every Sunday afternoon. Now that school is out for the summer, it is a little harder to coordinate, but we still get out at least once a week. I am also a huge fan of professional bike racing, and I watch all of the races I can get on my TV, especially the Tour de France.